for fast-paced, tongue in the cheek games. 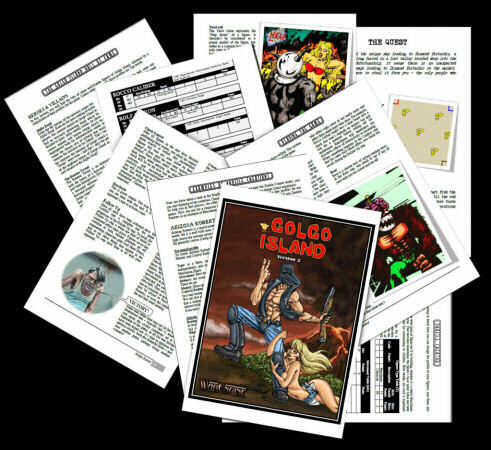 * The compiled WarEngine and Golgo Island rules. * Background on Golgo Island and its denizens. * Profiles for over 60 ready-to-play characters and henchmen. adapt them to your needs and imagination. Gallerne Jonathan 10 10 10 A very great and fun game! Quick, easy to learn and to play! Ulysse Lainé 10 10 10 Best illogical and non sense humourous miniatures wargames ever. 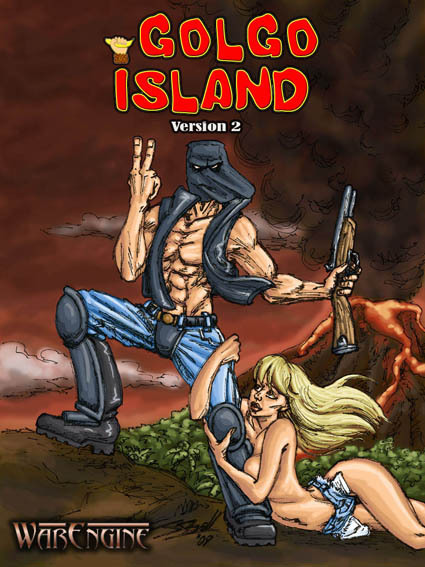 Anthony Ray 10 8 9 If you like your skirmish games face-paced, surreal, dangerous, full of b-grade action and just a little bit twisted, then you need to get your hands on Golgo Island! Sébastien Romaire 10 10 10 Just funniest and coolest mini game ever! Paul MacDonald 10 10 10 Great use of a great system. Much fun for the weird at heart. Alexis Arnold 8 8 8 An excellent game! Full of humor, a parody of the pulp genre! If you're too serious, just forget it and leave it to the others!